What Else Can I Expect from an Online Bachelor's in Human and Family Development Program? A bachelor's degree in human development and family studies explores human growth from birth through old age. By analyzing these topics, you'll gain an understanding of the psychosocial, emotional, and cognitive processes across the human lifespan, along with insight into the complex interplay of societal and cultural expectations within the family. Whether in the context of classroom teaching, healthcare delivery, social work, or other forms of community service, rigorous training allows professionals to provide the most effective assistance to individuals and families who need it. There's never been a better time to enter this field. The U.S. Bureau of Labor Statistics (BLS) projects a 10% increase in social and community services management positions through 2024, a boost in part due to an aging Baby Boomer population (with age comes a need for more services). This boom is also in part due to a demand for social services connected with a growing substance addiction problem in the United States. This guide details what you can expect from a bachelor's degree program in human development and family studies, including a breakdown of study concentrations and curricula. It culminates in a discussion of program graduate career options. The study of human and family development is multidisciplinary, involving the social, biological, and behavioral sciences. A typical online degree in human and family development curriculum begins with a small set of core courses that build a foundation for service to children, adolescents, adults, and families. Through these courses, you can expect to learn about the developmental processes of individuals and families, human sexuality, interpersonal behavior, and parenthood across the human lifespan. Core program classes also focus on career-specific skills such as research-based inquiry, program planning and evaluation, professional communications, and human services administration. In many online degree in human and family development programs, learners customize their studies through a specialty concentration. In this case, the bulk of your upper-division coursework will be within your concentration and concentrations may be organized to focus on specific age groups, such as elder care or early childhood. Concentrations may also be geared toward specific services, such as counseling or social work. Alternatively, an institution may design its available concentrations to mesh with a professional degree in law or medicine. 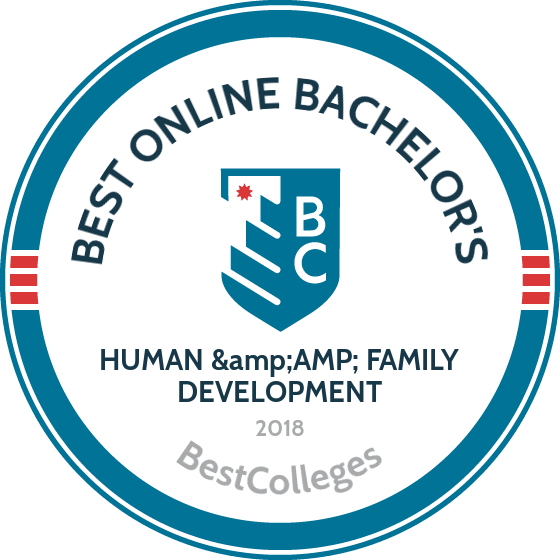 The best online bachelor's in family development programs take full advantage of a university's resources, offering numerous specialty paths to a degree. Degree plan customization doesn't always end with a concentration. Often, online bachelor's in human development programs include a field component that aligns with your concentration. Typical placements include schools, social services agencies, retirement facilities, hospitals, or behavioral health facilities. Some programs offer a thesis option in lieu of a practicum, which could be ideal for the student planning to pursue a professional graduate degree. Some programs lead to teaching licensure and some do not. In turn, it's wise to choose accordingly if you plan to teach. Finally, some programs further prepare you for the workforce by embedding professional certifications within their curriculum. Affiliated with the Church of Jesus Christ of Latter-day Saints, BYU-Idaho provides an academically enriching environment in which students can strengthen their Christian faith. BYUI offers more than 15 degrees online, and there's no limit to how many credits or courses students can complete through the school's online learning program. This allows students to earn an online bachelor's in family studies at an accelerated pace by taking courses year-round. BYUI's online programs are designed for students who have taken some college coursework and now want to finish their degrees online. BYUI provides a holistic approach to studying the home and family through its online BS in marriage & family studies. Courses include family stress and coping, infant and toddler development, and preparation for marriage. Graduates of this program are prepared to go on to entry-level management positions within a variety of family and child support services. Alabama has one of the top online human and family development programs in the country. Students who earn a BS in human environmental sciences, human development & family studies develop the skills needed to further their careers as child services practitioners in the Head Start program. The program focuses on the growth and development of children, from birth to eight-years old. This degree is only open to students who already work in a Head Start program. Students who don't meet this requirement may be interested in UA's early childhood education concentration instead. Online applicants who graduated from high school within the past four-years must have at least a 3.0 high school GPA to apply. Applicants who graduated from high school more than four-years before their application date need a 2.5 GPA. UA's affordable online tuition is the same for residents and nonresidents. Pennsylvania State is a pioneer in distance learning; the school developed its first correspondence courses in 1892. Online education is offered through the school's Penn State World Campus. Courses are asynchronous. Students can earn an online bachelor's in human development and family studies, with a life span human services or life span developmental science option. Students often go on to pursue human development and family studies jobs at preschools, daycares, mental health care centers for children, nursing homes, and other family care facilities. Learners are required to earn at least 120 credits. A grade of "C” or better must be earned in all classes. Students must complete a 480-hour field experience at a human services center in their community. Credits earned from an associate degree in human development and family studies can be applied towards the bachelor's. Some faculty may require students to earn credits on-campus. The University of Washington, based in Seattle, is Washington's flagship public university. It remains one of the largest universities in the country with an enrollment of about 46,000 students. Of the state's six public universities, UW boasts the highest graduation rate of 82%. Full-time students of the bachelor of arts in early care and education can expect to complete this program in as little as two years.The fully online degree uses a cohort-based model. Its curriculum covers introductory courses in childhood and family studies, general development, learning and teaching, an experiential senior project, and a research-based capstone. UW offers all courses at the same per-credit cost, with rates more affordable than other online human and family development programs. To apply, prospective students must present a cumulative transfer GPA of at least 2.5 and a minimum of 70 transferable quarter credits from a regionally accredited institution. The University of Washington is accredited by the Northwest Commission on Colleges and Universities. Texas Tech University, based in Lubbock, Texas, is a Tier-One public research university that offers more than 100 programs fully online. With seven regional sites across the state, TTU affords Texas-based online learners a unique opportunity to engage with their local community, while out-of-state students benefit from paying the same tuition. The bachelor of science in human sciences helps students explore multiple fields of study within the university's College of Human Sciences. Students select three areas of concentration -- two within the College of Human Sciences -- from a variety of topics, including interior design, addiction sciences, financial planning, and retail management. The core curriculum totals 120 hours and requires some face-to-face courses, such as lab sciences. Neither the application nor courses follows a set schedule; students can enroll in the online bachelor's in human development at the beginning of any one of four annual sessions and complete coursework at their own pace. The only application requirement to this bachelor of science in human sciences program is a high school diploma or GED. Texas Tech University holds accreditation from the Southern Association of Colleges and Schools Commission on Colleges. Oregon State offers more than 1,000 courses in more than 100 subjects of study online through Ecampus. OSU's Ecampus courses are developed by its faculty and delivered asynchronously. Online students are charged resident rates. Through the College of Public Health and Human Sciences, students can complete a degree in human development and family studies online. The degree emphasizes the development of critical thinking and communication skills, preparing students for careers in fields related to social justice. Students can complement their bachelor's degree with an online minor in subjects like psychology, sociology, and leadership. The Ecampus has a generous transfer credit program. Transfer students must take at least 45 of the last 75 credits for this degree through OSU. Distance learners must earn 180 credits to complete the degree. Course topics include human sexuality, human nutrition, families and poverty, and psychology. CSU's online human development and family studies degree offers students a customized degree plan. The program offers five concentrations to choose from: early childhood professions, leadership and entrepreneurial professions, pre-health professions, prevention and intervention sciences, and human development and family studies. Students specialize in one, or two of these concentrations. Concentration coursework consists of 15 credits. Students also have the option to minor in gerontology. With a minor in gerontology, students acquire a thorough understanding of the aging process. The program requires students to earn 120 credits. Students with prior college credit can check what courses will transfer through Transferology. Courses include individual and family development, couple and family studies, and general psychology. Students must complete a supervised field study experience. Online students are invited to graduation lunch and the graduation ceremony each spring. Graduates are prepared for careers in social services, law enforcement, and community outreach. The University of Southern Mississippi is a research-driven university dubbed an RU/H: Research University by the Carnegie Foundation. Regionally accredited by the Southern Association of Colleges and Schools Commission on Colleges, its diverse student body represents distance learners from 75 countries who benefit from the most affordable tuition rates offered among other online colleges in the U.S. Undergraduates who reach the full-time status of 12 hours can take another six hours at no additional cost. Online at Southern Miss, the online campus, offers 14 online or hybrid undergraduate programs. The bachelor of science in child and family studies takes place fully online. Students choose from two emphases -- child development and family relations -- depending on their career goal. The child development emphasis includes literacy courses, experiential lab courses, and a nine-credit-hour practicum that prepares students for human development and family studies jobs like kindergarten teaching or program evaluation. The family relations track includes more psychology or public health courses and only a three-credit-hour practicum in preparation for employment in human service agencies and nonprofit organizations. Southern Miss boasts that 87% of child and family studies graduates find work in their field (or continue on to graduate school) within a year of graduation. Though part of the University of North Carolina system, UNCG is a top-tier, standalone institution that confers its own degrees. The university's Online Division offers eight bachelor's degrees at rates lower than on-campus courses, including a bachelor of science in human development and family studies. This is an interdisciplinary program that combines early childhood special education with social and behavioral science. The "2Plus" online human development and family studies degree welcomes students with an associate in applied science degree in early childhood from a North Carolina community college. This program aims to help these graduates transfer with advanced standing. At their own pace, students prepare for birth through kindergarten teaching licensure or focus on child and adolescent development through respective concentrations. Students from all 50 states may apply and can transfer a maximum of 64 semester hours from a community college or an unlimited number from an accredited four-year school. Distance learners can also take online summer sessions to graduate faster. The University of North Carolina at Greensboro holds accreditations from the Southern Association of Colleges and Schools Commission on Colleges. Concordia-Saint Paul is one of the most affordable private education institutions in the Twin Cities area. The school remains affordable through its per-credit tuition for online programs, and once a student enrolls in an online program, tuition is guaranteed not to change as long as the student remains continuously enrolled. Through the school's online BA in family science, students learn to foster healthy family dynamics and instill strong communication between members. Concordia's accelerated online format courses are just seven-weeks long. The major consists of 39 credits. The family science program is approved by the National Council on Family Relations (NCFR), the nation's leading nonprofit professional organization focused on family research, practice, and education. Students in the online program have the option to complete a certification track to become a NCFR Certified Family Life Educator. Graduates are prepared for careers in early childhood education, child/youth development, public health, and more. California State-East Bay is committed to providing an affordable education to its diverse student body. The school boasts one of the lowest tuition fees in the nation and has been recognized in its efforts to help students from diverse backgrounds succeed academically. CSUEB is also considered the elearning leader in the California State University system. CSUEB offers an online BA in human development. Students pursuing the degree can choose from three course track options: adult development and gerontology, women's development, and early child development. CSUEB's online programs operate on a quarter schedule, with courses running for 11-weeks. Students can complete the online bachelor's in human development in two-years if they have already completed prerequisite courses. A full-time course load on CSUEB's quarter schedule is 12 credits, though students are permitted to take up to 22 credits. All coursework is delivered through Blackboard. Wisconsin-Stout, a polytechnic school, combines career-focused learning with a liberal arts education. The school serves nearly 10,000 students from 45 states and 46 countries. Wisconsin-Stout's BS in human development and family studies is a fully online program that has full-time and part-time options. Distance learners are required to earn at least 120 credits. The program is designed for students who already hold an associate degree from a technical school, or equivalent. Courses include abuse and the family, family policy, and family research and methodology. More than 90% of graduates from the school's online human development and family studies degree are employed in a related field or enrolled in a graduate program. With transfer credits, many students are able to complete their degree in two-years. Graduates are prepared for careers in family resource centers, rehabilitation centers, youth summer camps, and more. Arizona State University, located in Tempe, offers students more than 150 programs online and has more than 30,000 students enrolled online. The ASU Online student success center pairs each student with a coach who guides them through their education journey, and encourages them to find the appropriate work-life balance to achieve their goals. ASU Online offers a Bachelor of Science in Family & Human Development that can be completed fully online. Students pursuing this degree study contemporary issues that affect human development and family relationships including the impact that gender, ethnicity and culture have on human development and healthy family functioning. This program requires students to earn 120 credits with a minimum 2.0 GPA. Approximately 80 percent of ASU Online bachelor’s degree students are transfer students. To transfer to ASU, you must meet one of the following requirements: graduated from high school, earned a GED, are in progress towards an associate degree, or have completed your associate degree. If you have earned fewer than 12 credits (at a minimum 2.5 GPA), you are considered a Freshman Applicant. ASU also has a Guaranteed Program for Admission in partnership with 50 California community colleges. Kansas State University, based in Manhattan, Kansas, was the state's first public institution and currently holds accreditation from the Higher Learning Commission. Within the student body of almost 24,000, 94% of undergraduates land jobs within six months after graduation. K-State takes pride in ranking first among multicultural and high school students residing in Kansas. The university also offers 2+2 partnerships that allow students to complete an entirely online bachelor's degree. The K-State Global Campus offers more than 70 distance learners programs at the same tuition rates for all students. The 120-hour bachelor of science in human development and family science includes courses like families and diversity, aging, and intro to human sexuality. Students choose a specific discipline, such as psychology, gerontology, or women's studies. Degree seekers can complete up to half of the required credits at a two-year institution, and those who complete all online bachelor's in human development coursework, including internships, can apply for the Provisional Certified Family Life Education (CFLE) designation. To apply, students must have already completed a minimum of 24 college credit hours or present proof of a minimum 2.0 cumulative GPA. North Dakota State, located in Fargo, serves more than 14,000 students across the state. Students can choose from 35 fully online and blended undergraduate, graduate, and certificate programs through NDSU's Distance and Continuing Education program. Students seeking a degree in human development and family studies online are drawn to NDSU's flexible program. The BS in human development and family science is offered fully online, aside from a required field experience component. Students choose from three program tracks: adult development and aging, child and adolescent development, and family science. Full-time students can complete the program in about four-years. By taking courses during the summer the degree can be earned sooner. NDSU's transfer policy requires online transfer students to complete at least 36 credits through NDSU. Most courses are delivered through Blackboard. Courses include family sciences, lifespan development, and child development. Northwestern State University, based in Natchitoches, Louisiana, is home to eNSU, a military-friendly global campus and the state's first and largest campus of its kind. NSU’s global campus offers a unique bachelor of science in child and family studies with a concentration in child development and family relations that focuses on meeting the needs of children and families in a variety of contexts. The curriculum covers not only subject-specific courses like infant and child development and human ecology, but also nutrition, parenting, and early childhood education. The online bachelor's in family studies includes a minor and 270 hours of on-the-job training (90 hours during sophomore year and 180 during senior year). Distance learners who attend NSU exclusively online pay flat-rate tuition without any added out-of-state fees. As part of the Louisiana Transfer Degree Program, graduates from participating community colleges can transfer all 60 hours of coursework if they present a grade C or above. Northwestern State University is regionally accredited by the Southern Association of Colleges and Schools Commission on Colleges. Through its Global Campus, Washington State fosters community bonds for its online students. Each online student is assigned an advisor. Online student resources include online tutoring and 24/7 tech support. WSU's Global Campus has its own student government, who plan face-to-face events so online students have the chance to meet and mingle with one another. WSU's online BS in human development equips students to help individuals struggling with many life challenges. Coursework includes topics like child maltreatment, child and parent relationships, and families in poverty. Students can customize their degree with a concentration in gerontology or early childhood education. The early childhood education concentration is only available to residents of Washington state. Students can enroll in the program after completing at least 24 college credits and earning at least a 2.35 GPA. Students are can transfer these credits from community colleges. Arizona is committed to providing a flexible and affordable education for its distance learners. Nonresidents pay the same rate as Arizona residents. UA has developed an online learning management system, powered by D2L. Arizona has one of the best human development and family studies programs online. Graduates of the bachelor of applied science: human services emphasis program are prepared for careers in social work, emergency response, and law enforcement. It also prepares students for graduate studies. The online degree is a 2 + 2 program; students who want to enroll in the program must complete their first two-years of general requirements at a community college and then transfer to UA. Applicants must have at least a 2.5 GPA in their community college coursework to apply. There is a two-semester second language requirement. Courses include critical thinking, human services, and program planning. As part of Warner Pacific College in Portland, Oregon, the Adult Degree Program (ADP) boasts more than 25 years of experience in providing Christ-centered education to working adults. All ADP programs take two years to complete and several, including the bachelor of science in human development, come in a fully online, cohort-based format. The online bachelor's in human development best suits students pursuing human development and family studies jobs in ministry or a graduate study in social sciences. The curriculum consists of 14 five-week courses that cover topics in counseling, psychology, and sociology, conflict resolution, leadership and supervision, and cultural studies. The program is open to students with at least two years of full-time work experience who have completed 48 credits of coursework at another college and hold a minimum GPA of 2.0. Warner Pacific College is regionally accredited by the Northwest Commission on Colleges and Universities. Accredited by the Higher Learning Commission, the University of Colorado-Denver is Colorado's largest public research university and is home to two campuses with more than 18,000 enrolled students. CU Online, established in 1996, offers more than 450 courses in asynchronous format. With the option to choose their own pace, online students can study more than one course at a time within the bachelor of science in human development and family relations. Students of this program are also eligible for a stipend through the College Opportunity Fund. As the first bilingual (Spanish) program of its kind in the U.S., the degree in human development and family studies online curriculum prepares students to serve linguistically and culturally diverse families and communities. The program attracts students passionate about social justice who can specialize in one of nine concentrations. Across 120 credits, they study unique topics, such as global family resource management, LGBTQ and family systems, adult ecology, and Latino families in later life. CU Online encourages students from all backgrounds (including nontraditional and underrepresented students) and transfer credits from both community and four-year colleges. AU Online, part of Antioch University's Yellow Springs, Ohio campus, focuses on degree completion studies at an undergraduate level. Its eight entirely online bachelor's degrees include a 120-credit bachelor of arts in human development that highlights various stages of development across cultures. The curriculum contains two parts: an interdisciplinary core and a major core. Courses in the former include experience and expression, foundations of civilization, and literary analysis. In the major core, students take courses like gender and multicultural issues, behavioral psychology, and contemporary family patterns. They must also complete a senior project and one of two focus areas, clinical mental health counseling or adult development and aging services. Applicants to the online bachelor's in human development program must submit at least 24 semester credits of undergraduate coursework from a regionally accredited institution, a resume, and a goal statement. AU Online accepts a maximum of 75 semester credits and credit for life or work experience. Future students can send unofficial transcripts to find out which credits are eligible for transfer. Antioch University is regionally accredited by the Higher Learning commission. SUNY Empire State College's mission is to lead the way in nontraditional education, providing online and flexible degrees in 35 locations across New York and abroad. Based in Saratoga Springs, the college enrolls more than 10,000 undergraduates who can choose from 12 areas of online study. Out-of-state students are automatically eligible for SUNY Empire's nonresident tuition grant. The bachelor of science in human development totals 124 credits and usually takes four years to complete. Its fully online curriculum draws from a variety of disciplines, including anthropology, psychology, and human biology. The curriculum is particularly uncommon among other online human and family development programs. Noteworthy classes include American sign language, modern China and Japan culture, attachment (continuity and separation), and statistics for social sciences. Students also enjoy opportunities to participate in field placements, earn credit for prior work experience, and access to 24/7 personal tutoring. SUNY Empire State College is regionally accredited by the Middles States Commission on Higher Education. Permian Basin, part of the University of Texas System, serves students from 31 states and 31 countries. The school ranks third in the state for graduate employment and graduate school placement. The school offers online degree programs, some of which are offered in conjunction with other schools in the UT system. This includes the online BA in child and family studies. Students follow a learning and development track focused on the development of children (including atypical development) and relationship dynamics within families with children. Many students who pursue this degree also seek teacher certification; teacher certification is not offered online through Permian Basin. Students from across the U.S. can enroll in this online bachelor's in family studies program, except for residents of Massachusetts. Students are required to earn at least 120 credits and maintain a 2.0 GPA. At least 30 credits must be completed through Permian Basin. Utah State has seven colleges across Utah, serving more than 28,000 students. USU offered its first fully online course in 1997. The school offers over 30 degrees and programs that can be completed fully online. Online students can take advantage of USU-Online's e-tutoring, software discounts, and remote IT help. USU's BS in family life studies is only offered online. Admittance requires students to have at least a 3.0 GPA in previous coursework. The major is designed with adult learners in mind. USU's online class scheduling allows students to accelerate their online bachelor's in family studies by completing coursework on their own schedules. Most courses are offered in a 14-week format. Students are encouraged to specialize in a certain area of family life through the program's capstone practicum experience. Nonresidents pay a reduced tuition rate for online courses, while residents pay the standard tuition rates. The University of Arizona South offers an online human development and family studies undergraduate degree that prepares graduates for meaningful work with children, parents, survivors of domestic abuse, and elderly populations. This is a degree completion program, so interested students need to have at least 60 credits from another institution before applying. Students typically complete the program in two years if enrolled full-time; part-time study is available. Required classes include issues in aging, infancy and child development, and sociocultural context of development. Math courses are also required, along with two semesters of foreign language coursework. UASouth’s program is led by a small group of academically qualified and experienced practitioners who also teach at the school’s brick-and-mortar campus. Learners should have a minimum 2.0 GPA in all transfer courses. Every family development degree online program is different. Depending on its access to cross-disciplinary departments, one program may offer only a few specializations while another program may offer up to a dozen. Still others may offer certain concentrations exclusively online while administering an amount of concentrations solely on campus. Below we've broken down course content for five popular concentrations and the careers for which they prepare graduates. Life-span development: Sometimes spanning two terms, this course explores physical, social, cognitive, and emotional growth from birth through senescence. Discussion focuses on an individual's place within the family at each phase of life, and corresponding cultural and societal factors and elements. The course also covers contemporary issues and social policy. Marriage and family relationships: In this course, students analyze topics such as courtship, close relationships, marriage, and family systems within the context of internal and external factors that influence them, such as cultural norms, societal expectations, and individual personalities. The course also addresses the changing role of family from a long-term perspective. Intervention and problem-solving: Students enrolled in this course examine historical and contemporary approaches to formal and informal intervention. This class focuses on the role of the professional and effective strategies for resolution with individuals and within families. Administration of human services programs: This course focuses on the fundamentals of program content, strategy, and strategic planning in community-oriented public services programs. Additionally, the course emphasizes best practices in program development and administration. Statistics in family and consumer studies: Students enrolled in this course analyze and examine data relevant to the human family development sector. The course places emphasis on means, standard deviations, T-tests, chi-square, ANOVA, regression analysis, and correlations. HOW LONG DOES IT TAKE TO GET AN ONLINE BACHELOR'S IN HUMAN AND FAMILY DEVELOPMENT? At the baccalaureate level, an online degree in human and family development program requires that a student completes an average of 120 credits to graduate. Full-time students generally complete the program in four years, whether online or in traditional classrooms. However, depending on your circumstances, part-time study may be advantageous, allowing you to take more time to finish your program. Most universities do place a time limit on part-time study, generally somewhere from seven to 10 years. It's worth noting that schools often require that students adhere to full-time attendance (defined as a course load of at least 12 credits per term) to be eligible for financial aid. Distance learning can be an ideal choice for both the traditional or nontraditional student. Allowing for full-time or part-time study, online bachelor's in human development programs offer scheduling flexibility that you won't find on campus. Accelerated online degree programs exist in some academic disciplines, but human and family development isn't one of them. Be sure to weigh potential programs carefully. After all, higher education is a significant time investment. If you've already attended some college at an accredited school, you may be able to transfer some (or even all) of the credits you've earned into your current program and, in turn, shorten the time it takes to earn your family development degree online. When any academic program is accredited, its curriculum and admissions process has been vetted by a neutral accreditation agency. This process ensures that a standard of academic rigor and fairness can be reasonably expected from an accredited institution. Schools may earn accreditation on the national, regional, or program level (or even all three). The three varieties differ. National accrediting bodies focus on a type of education, such as technical or vocational. If you're mulling an online degree in human and family development, consider searching for schools that have earned national accreditation from the Distance Education and Training Council Accrediting Commission. Regional accreditation bodies focus on academic rigor. In turn, regional accreditation carries more weight than national accreditation, particularly when it comes to graduate school admissions. Though the federal government does not involve itself at the accreditation level, the U.S. Department of Education does provide oversight of the accreditation process. It also maintains a database of accredited schools. Similarly, the Council for Higher Education Accreditation (CHEA) is an independent association of accredited degree-granting institutions and offers a database of accredited schools. Completing a four-year degree nearly always pays off in higher earnings and greater career mobility. While completing a human and family development bachelor's program, graduates prepare for roles that correspond to their specialty. In many cases, these graduates hold a competitive advantage over peers who lack a four-year degree. The table below illustrates education's boon to students who specialize in early childhood development. Though figures vary based on geographic location and specialty area, graduates of online bachelor's in human development programs can expect decent starting salaries after graduation. As with any job, more work experience leads to higher salaries. The following table lists average earnings in five common roles for which graduates are equipped. Beyond the options we've discussed so far, this degree program's versatility opens the door to many others career paths, including human resources, public relations, and professional development positions. The nonprofit sector is also a fine option, often employing fundraising and volunteer coordination staff. These programs serve as stepping stones to graduate study, leading to roles as attorneys, physicians, nurses, and therapists. Generally employed by government or nonprofit agencies, social worker identify problems that affect communities, families, or specific individuals. Working with cross-disciplinary resources, social workers work to solve programs or mitigate them as much as possible. Daily tasks might include arranging for a family to receive food stamps, referring a teen to counseling, or investigating a claim of child neglect. Community services managers supervise and coordinate the administration of a social service agency or community service program. Depending on the employer's size, daily duties may center around a specific program or encompass an entire facility's programming. Duties include budgeting, strategic planning, staff development, program assessment and analysis, grant writing, and community outreach. Working mostly in public schools, these teachers work with children who are intellectually, emotionally, mentally, and/or physically challenged. Typical duties include adapting a mainstream curriculum to students with mild to moderate disability, IEP development and implementation, assessments, and serving as liaison between parents, social workers, psychologists, and therapists. Emphasizing skills necessary for the myriad activities of daily life, occupational therapists help their patients recover from illness or injury. Occupational therapists may also work with newly disabled patients to help them better adapt to a different way of living, and they develop strategies for tasks like preparing a meal and getting dressed. Occupational therapists educate families about a patient's needs and work with patients to develop exercise routines that build strength and flexibility while reducing pain. Nursing home administrators manage a program or department within a retirement facility in accordance with healthcare legislation and regulatory compliance rules. Scope of responsibility can include building and grounds, admissions, finances, and patient care. Typical tasks include staff recruitment, program development, budgeting, and staff scheduling. Supervising nursing staff, nursing home administrators rarely care for patients directly. Students and working professionals alike benefit from membership in industry-specific professional organizations. These organizations offer networking opportunities that often pay off as you build your career and by hosting conferences, holding educational seminars, and hiring guest speakers to discuss relevant issues, they provide a means to stay up-to-date in your field. If your specialty area requires continuing education credits, many professional associations offer CE options to members. Larger organizations frequently publish journals, newsletters or other materials that can also help you stay current. Because the human development and family studies umbrella covers so many disciplines, it's impossible to list all pertinent organizations here, but through due diligence and research, you'll find the associations most applicable to your career goals. A national organization and the only association that offers membership across disciplines, AAFCS offers continuing education, scholarships and fellowships, professional certifications, and a long list of networking opportunities. Notably, the AAFCS publishes The Family and Consumer Sciences Body of Knowledge, generally considered to be an industry gold standard. This international organization boasts 50,000 marriage and family therapists in its membership. AAMFT member benefits include a jobs board, links to endorsed educational programs, scholarships and fellowships, online training, networking events, and research support. Non-members may also access the site's Find a Therapist feature. Offering the internationally recognized Certified Family Life Educator (CFLE) credential, this multidisciplinary organization is focused on professions devoted to strengthening the family. NCFR members enjoy access to a jobs board, networking events, three peer-reviewed journals, and an extensive digital resource library. This international organization primarily facilitates research across disciplines involved in child development. Because it of the society's research-oriented nature, SRCD is particularly well-suited to students. Member benefits include discounted textbooks, funding for independent research, mentoring, networking opportunities, travel awards, and scholarships. The discipline's largest professional organization, NASW authors the industry's code of ethics and behavior. NASW members enjoy professional development opportunities through Specialty Practice Sessions, a jobs board, access to professional credentials, continuing education, and a wealth of best practices information. Undergraduate students at any accredited university may apply for financial aid by filling out the Free Application for Federal Student Aid (FAFSA). Student aid providers use the FAFSA to calculate federal and state need-based awards such as grants, scholarships, and low-interest loans. High achievers may also qualify for merit scholarships or fellowships offered by a school or a department. Likewise, financial aid organizations and school departments make a wealth of scholarships available to students who meet their eligibility standards. It's important to note that even if you don't think you qualify for federal financial aid, you must complete the FAFSA to be considered for any other type of monetary award, in part because most schools use FAFSA data to manage students' financial aid packages.